The nagging thought has haunted you for days, months, years. "I must move to Israel". "I need to make Aliyah." You have argued with yourself. You have debated with your friends the pros and cons. You have dried your Mother's tears. Night after sleepless night you tossed and turned as the good, the bad, and the ugly paraded before you. The questions keep on coming at you and swirling around you like a tornado. Logic bashing belligerently up against faith. "Why should I leave a perfectly good life and go thousands of miles away to who only knows what? Everything here is familiar and predicable. At least I know the language. I have family and friends here. There, I have no one. Nothing. No job. No home. No security. I am not even sure I like the food. And it is so dang hot! Aside from all of that, it seems like there is always one war or another happening or getting ready to happen! Agggghhhhh!!!!" The decision to make Aliyah is always one filled with conflict. There is a whole lifetime of the Familiar to wrap its arms around us and make us comfortable and cozy. Even for the adventurous soul, how big of a leap are we willing to make and for how long. Maybe a tour. Maybe an extended visit. A year of study abroad or volunteer on a kibbutz. But to actually pack it all up and move permanently.... it is like... like.... jumping off a cliff! "Leave your country, your people and your father's household and go to the land I will show you"
Avraham obeyed and went to a place he did not know. One cannot begin to imagine what that was like for Avraham. Leaving all behind. All security. Any fall-back plan. Protection and provision. Venturing day-by-day into unknown terrain. For those who have inherited the promise of a home in the Land, the launching out is very similar. Except we DO know where we are going. We DO know what is ahead and what waits us. G-d has given the Land as part of the inheritance. Scary? Yes. Possible? Definitely. 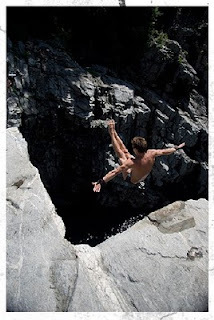 A little like jumping off a cliff? Make the decision and find out! Is it cheating to use a parachute?? ?